Herbein’s Garden Center is making some spectacular changes this holiday season! We will be offering our customers SIX varieties of fresh cut trees with the addition of artificial! Check out these names – Douglas Fir, Fraser Fir, Balsam Fir, Concolor Fir, Blue Spruce, and Meyeri Spruce! PLUS…artificial trees are making their way into our winter garden store! High quality trees for someone with allergies, or anyone who just wants to simply set up & tear down in a few minutes time. Are you looking for something NEW and UNIQUE? Well, we’re the place to see this year for quality gifts and accessories. 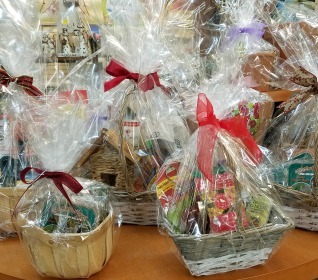 Great gift baskets are on display now for early shoppers. And if you don’t see one you want, just give us a budget and we’ll create one just for you! Prices as low as $6.99! These make perfect gifts for the office, teachers, mom & grandma, or how about one for the little girl or boy interested in the earth? Stop by during our Christmas Preview being held Saturday and Sunday November 18th & 19th during regular store hours. Everything is 20% off!! STOREWIDE!